As an organization, the Scranton/Wilkes-Barre RailRiders understand that it is the citizens of NEPA that make the team successful. Their support, loyalty and patronage make PNC Field a great place to work and play. This organization understands that we have a level of social responsibility to meet, and we plan to exceed that level. It is our goal to be as active in the community as possible. We show great levels of support for our nation's military, past and present, local non-profit and civic groups, schools, churches, programs for the disadvantaged and less fortunate, as well as other groups and people in need. 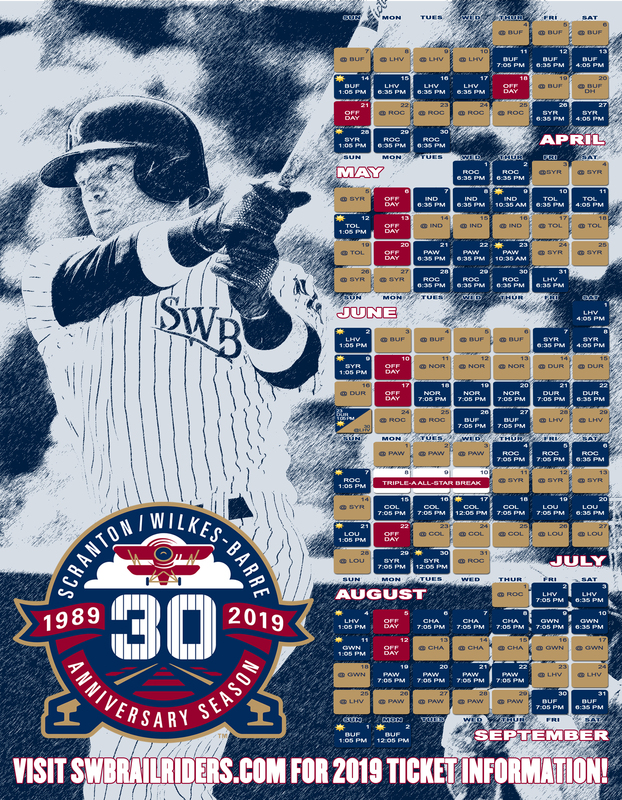 The SWB Pinstripes Foundation was formed in 2017 as the non-profit, charitable arm of the Scranton/Wilkes-Barre RailRiders. The SWB Pinstripes Foundation will support charitable organizations that aim to improve the quality of life in the Northeastern Pennsylvania area. CHAMP's Kids Club is the coolest way to see the RailRiders play! All members receive an exclusive membership card plus much more! More information on Fundraising for the 2019 RailRiders season will be available soon! The Scranton/Wilkes-Barre RailRiders are looking to sponsor local youth baseball and softball teams in our area! If you would like a team in your league/town to be sponsored by the RailRiders let us know! The Sheetz Seatz will provide up to twelve tickets per game to local Non-Profit agencies/charitable organizations. For all seventy home games here at PNC Field, local organizations will get to enjoy a game from the front row in the Sheetz Seatz. The Scranton/Wilkes-Barre RailRiders are committed to making a difference and supporting the NEPA community through charitable donations and appearances. To request a ticket or merchandise donation, or a mascot appearance please click the button below. For every RailRiders home games at PNC Field, we have hosted a local non-profit/civic organization in the ballpark. To show support of our local heroes, the RailRiders will honor one local hero and their family at every home game during the 2019 season. Join the Pros as they host a series of training camps at PNC Field, home of your Scranton/Wilkes-Barre RailRiders. Have the chance to use our premium facilities to improve in all areas of your game and get tips from the players who have learned the best techniques. If you are performing or would like to perform the National Anthem at PNC Field during the 2019 season, information is now available! All the details on how you can perform in one central location. The RailRiders are seeking a youth baseball field in need of a serious face-lift. Little leagues, athletic fields, softball fields, play grounds, and community fields are all eligible for the Adopt-a-Field program. All proceeds from the SWB Pinstripes Foundation's 50/50 Raffle benefits the SWB Pinstripes Foundation and their fundraiser for the Ronald McDonald House of Scranton. With diverse backgrounds and experiences in professional baseball, the RailRiders Speakers Bureau can offer a guest speaker to local clubs, civic groups or non-profit organizations at no charge. The RailRiders and Northeast Eagle Distributors have partnered for Bar Crawl events. Check back soon for all of our upcoming dates. Look for information on all RailRiders community involvement on ww.swbrailriders.com, Twitter and Facebook. For questions concerning any programs, appearances and donations please contact our Director of Community Relations, Jordan Maydole at 570-558-4616 or jmaydole@swbrailriders.com.